Many of us have a fascination with graffiti art, and we sometimes even look over our shoulders to make sure no one’s watching when we scratch out our initials in a freshly laid slab of cement — or carve them into a wooden desk — or even scribble profanities across the stall door in a public restroom. The creative minds working for Sharpie, the ultimate in permanent markers, have discovered a way to satiate our desires to deface public domain. 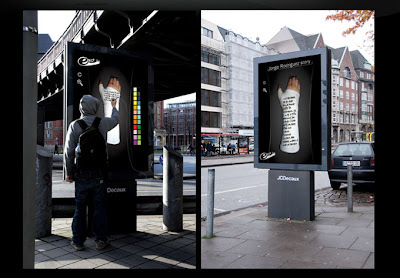 Interactive e-cast billboards have been scattered around cities, which allow people to experience the rush of creating their own graffiti. Choose some colours, write a message and Sharpie makes it possible for anyone to leave his permanent mark on the side of the bus stop or the public phone or anywhere else billboard adverting may be experienced. Andrew J Wiener.